The teams are making their entry to the FIFA anthem. A minute of silence is observed for the victims of the earthquake and tsunami in Japan. Kickoff is signalled by the referee. 0m40s Koloale break dangerously into the Amicale penalty area through Benjamin Totori. Amicale win back the ball and turn the attack Koloale’s way. 2m0s Amicale have had the ball for the last minute but Koloale is not letting them past the midfield area. 2m35s Koloale win a corner. A short one is taken Totori comes in with the ball but the Amicale defenders block his path. They head into Koloale territory but again play is broken down in the midfield area and Koloale look for opportunities again. 4m0s No shots on goal yet. Amicale are threatening Koloale through the lines and the first attempt at goal by Fenedy Masauvakalo is blocked by Leonard Olea. 5m20s Masauvakalo and Jack Wetney combine with short passes but the former is flagged offside and Koloale are given some breathing space. 6m55s Koloale are being pushed back here as Amicale short passes to break through them but so far no clear shot at goal has been made by either side. 8m0s Crowd flow into Lawson Tama is continuing. 8m40s Stanley Waita sets Masauvakalo up for a run into the Koloale 6-yard box but Samson Takayama makes a clearance but Amicale win a corner kick. Waita follows up with the corner kick but Koloale manage to clear the ball to safety. 10m38s Amicale break through again and Wetney sets up Waita for the shot but Koloale defenders block the ball away. Amicale is enjoying a good spell in the game. Koloale are yet to register a shot on goal. 12m0s Koloale win a corner kick after good pressure from Joses Nawo. He takes the kick but Nelson Sale rises up to clear the ball to safety for Amicale. 13m40s Koloale are once again being pushed back and they are forced to make back pass to their goalkeeper. 14m9s Amicale win a free kick halfway between the Koloale penalty box and the centre. Richard Anisua takes a direct shot at goal but Koloale defenders are able to clear once again. 15m25s Koloale win their third corner kick. A short kick is taken by Totori and Nawo makes the shot which Sale is able to deal with easily. 16m38s Koloale escape another scare when Shadrack Ramoni clears but Masauvakalo was advancing towards him with pace. 17m0s The match is evening out and Koloale and Amicale are starting to share runs into each other’s half but so far no clear shot at goal has been taken. 23m11s Mostyn Beui squanders an opportunity in a good position sending his ball high over the cross bar and the crowd is not happy. 25m0s Koloale are getting back some control of the game. 25m32s Koloale go close again. Totori breaks down the line and makes the cut back Paia but it bends too much and Amicale defenders clear the ball away. 28m08s Nawo wins a free kick in a dangerous position after he was tackled by Waita. Totori lines up a direct shot at goal but Jean Yelou is blocks the ball out for a throw-in. 29m34s Koloale take the throw a cross goes in for Jeffery Bule but his header is too weak and Ernest Bong easily makes the save. 30m28s Amicale make a good run starting with Yelou who makes a through pass but none of his forwards makes a run and Ramoni comes out for an easy save. 31m15s On the other end of the field Koloale win a free kick and Totori takes the shot which is deflected out and they win a corner. The cross from the corner comes in and Paia gets connects with a powerful header but Bong taps it out. 33m40s Gibson Daudau sets up a good pass for Masauvakalo who manages to reach the ball but he puts too much into his first touch and the ball rolls away from him. 35m45s Paia makes a powerful run into the Amicale penalty with defenders close to his heels. He turns in a cross but Bong quickly moves out to block the ball before it could get to the lurking Totori. 37m0s Koloale players call for a penalty as Nawo is brought down by Selwyn Seseala but the referee waves play on. 38m40s SUBSTITUTION: Moffat Deramoa replaces Richard Anisua who is injured after clashing with Paia while chasing a cross. 42m12s Freddie Kini is warned by the referee after a hard tackle on a Amicale player. Amicale also get a free kick from the infringement. The ball is sent foward but it goes high above the players and Ramoni makes the save. 43m18s Masauvakalo sets Waita for a shot he takes it well but the ball just bends out for a goal kick. 44m0s CAUTION: Freddie Kini receives the first yellow card of the game. 45m0s 1 minute of additional time will be played. Referee signals the end of the first half. 45m53s Amicale win a corner kick. Yelou takes the kick and Waita manages to get on the end of it but his attempt goes over the cross bar. 47m47s Masauvakalo is caught offside while chasing a ball from Yelou. 48m55s Yelou agains builds up a good attack but Wetney is flagged offside on the far side of the field. Koloale are starting slowly and Amicale look to capitalise on this. 50m34s Deramoa almost get their goal when Deramoa picks up a through pass but Ramoni comes out to save the ball. 51m11s Deramoa goes close again when Waita chips a high ball for him but his shot goes straight across the face of goal and Koloale fans breath a sigh of relief. 52m32s Masauvakalo forces the Koloale back into their own penalty box with direct pressure but he runs out of options and has to go wide and Koloale defenders follow up to make a clearance. 53m40s Masauvakalo breaks again down the line and he makes a cross but Takayama gets to the cross in time and he makes the clearance. 54m0s Totori breaks with a 3 on 2 situation but Sale closes him down and forces him to make a cross which does not go right for Koloale. 55m45s Paia wins a free kick when Alphonse Bongnaim takes him down just outside the Amicale penalty box. Totori sends in the cross but Bongnaim is there to head it out but Nawo gets to the ball and shoots but it is blocked again and Amicale take the ball out of their area. 57m37s SUBSTITUTION: Batram Suri comes in for Jack Wetney for Amicale. . 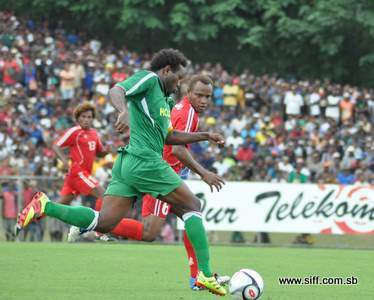 The crowd cheers as the veteran Solomon Islands striker enters the field. 58m46s Richard Garae is picked up by the Amicale midfield and the ball goes to him. He takes a shot on goal and Ramoni is forced to make the save but the ball does not go out. Koloale defenders follow up to make a clearance. 60m0s The hour mark is reached. Amicale have started the second half excellently. Koloale had their moments but more opportunities are being created by Amicale. 61m01s SUBSTITUTION: Derek Malas comes in to replace Stanley Waita for Amicale. 65m0s Amicale are playing with fluidity but despite their number of attempts at goal they have not registered anything yet. Koloale are yet to consolidate play in the second half. 67m45s Garae makes a powerful run beating 3 Koloale defenders before shooting but Ramoni manages to get a hand to the ball and it spins outwards and Francis Lafai clears. 68m23s Masauvakalo gets on the end of a through ball from Garae and he shoots from the edge of the penalty box, Ramoni gets in the way to save the ball. 70m0s Koloale are lacking chances and their situation up front is worsened as Paia limps out with an injury. 72m0s SUBSTITUTION: Ian Paia is replaced by Ezra Sale for Koloale. 74m26s Koloale win a free kick just inside their own half after Suri fouls Kini. The pass gets to Lafai who tries to beat Deramoa but he wins the ball and clears it away. 76m0s Garae makes a long cross across to Masauvakalo who is free on the left but Koloale defenders cover him and he is forced to take the shot but it does not go well for him. 77m29s Totori wins a free kick after he is fouled by Daudau. Totori takes the kick and he goes for goal but Bong moves to make the save. 79m44s CAUTION: Dadau of Amicale is given a yellow card for a heavy tackle on Nawo. A free kick is awarded to Koloale. Totori is there to take the kick, he cross the ball in but it sails too high and goes out for an Amicale goalkick. 82m0s The game slows down uncharacteristically. Amicale are giving away the ball to Koloale. 82m45s GOAL: Koloale 1 – Amicale 0, Nawo scores after Bule puts a through pass to him and he beats Bong and Bongnaim before sending the ball home. 84m40s Totori breaks through with lovely footwork but he is ruled offside and the all his efforts are cancelled. 86m0s Play is stopped as the corner flag on the far side is repaired. 86m51s Garae goes close again but Ramoni makes the save following a corner kick. 88m20s Masauvakalo gets on the end of a Suri pass and he moves to the centre before taking the shot but it goes wide. 90m0s 4 minutes of additional time will be played. Masauvakalo is taken out of the field after suffering an injury after a clash with Lafai. 90 + 1m32s Koloale have not confirmed their victory yet and they are pressuring Amicale who has only 10 players on the field. 90 + 3m0s Amicale have their chance to equalise as they pressure through Daudau. The ball goes out for a throw-in. Koloale win back the ball and go towards the Amicale goal but meet stiff opposition there. Referee signals the end of the game.